Imagine being a young poet, nurturing your craft without the benefit of established mentors. Imagine having never been in a class taught by a woman poet or not having a bookshelf filled with books written by living women poets. Luckily, young women poets today don’t have to. 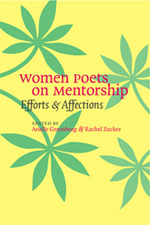 Arielle Greenberg and Rachel Zucker’s Women Poets on Mentorship: Efforts and Affections collects both personal essays and representative poems by women born after 1960 whose careers were influenced-directly or indirectly-by the women who preceded them. The poets in this collection describe a new kind of influence, one less hierarchical, less patriarchal, and less anxious than forms of mentorship in the past. Vivid and intelligent, these twenty-four essays explore the complicated nature of the mentoring relationship, with all its joys and difficulties, and show how this new sense of writing out of female experience and within a community of writers has fundamentally changed women’s poetry.